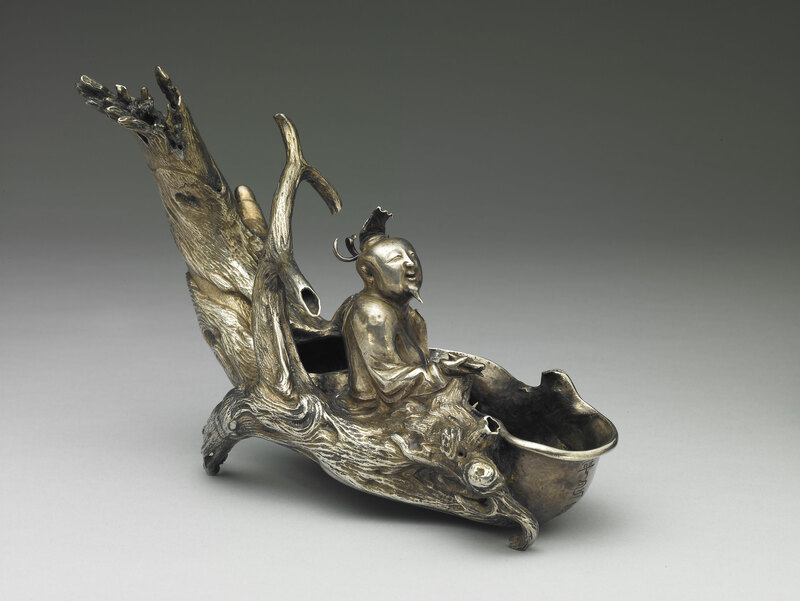 This silver raft cup takes its theme from the story of Zhang Qian of the Han dynasty, who was said to have rode a raft to trace the source of the Yellow River, and eventually travelled to the Milky Way, where he met the Cowherd and the Weaver Girl. 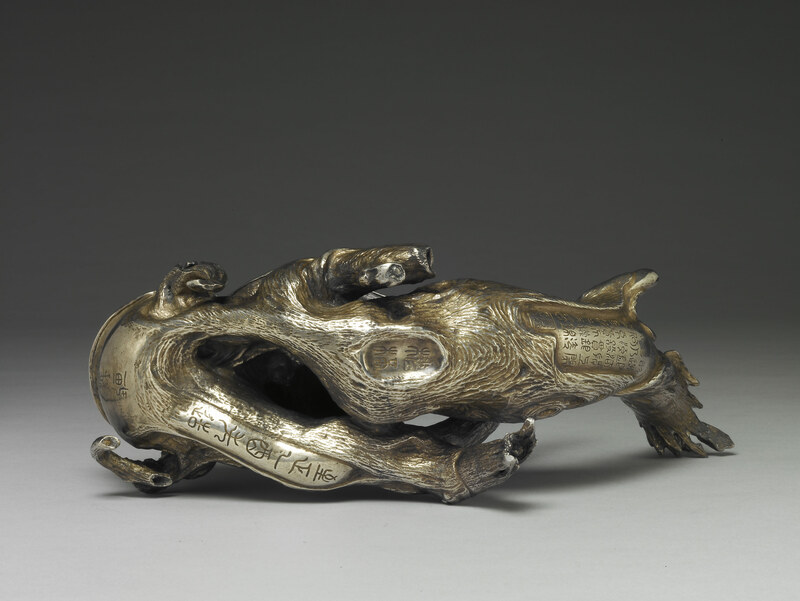 This raft cup takes the form of a single natural hollowed log, in which Zhang Qian sits, gazing at the heavens. 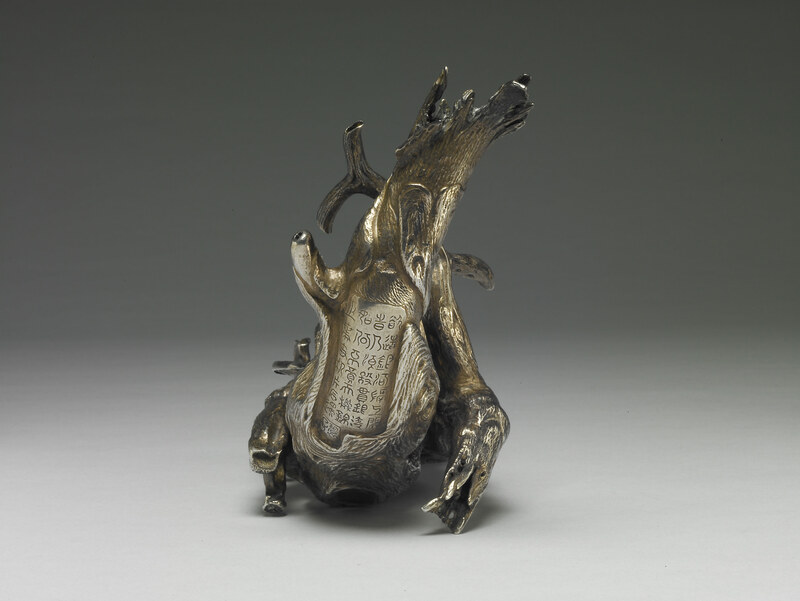 With headdress fluttering and robes open, Zhang Qian smiles into the breeze as he holds a rectangular stone in his right hand, upon which is engraved the two characters, “zhi ji” (loom weight), in seal script. The overall design is elegant and reserved, characterized by flowing, well-crafted lines and vivid features that are indicative of a masterpiece of silverwork. Based on the seal script engravings, “bi shan zi” and “Manufactured in the Yiyou year of the Zhizheng reign” (circa 1345) on the underside of the raft cup, this artifact may have been made by the famous Yuan dynasty silversmith Zhu Bishan of Jiaxing, or by some other silversmith that was skilled in the chiseling style of silverwork perfected by Master Zhu. The Qing dynasty Neifu (Imperial Household) housed three silver raft cups made in the style of Master Zhu in its collections, each with unique designs and craftsmanship. 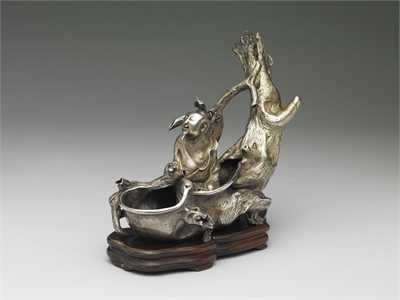 Another silver raft cup concurrently on display is a replica made by the Neifu in the 31st year of the Qianlong reign (circa 1766) of a work by Zhu Bishan, the original of which is now housed in The Palace Museum in Beijing. The replica reflects the continuation and development of chiseled silverwork during the Qing dynasty.